If you’ve ever been to a good Italian restaurant and ordered Chicken Piccata, then you know how incredibly delicious this dish can be. It’s so simple, yet tremendously flavorful. There’s an amazing Italian restaurant not to far from me that I paid a recent visit to (I was craving their breadsticks, but that’s a different story). While I was there, I noticed something on the menu that I simply had to try. It was a twist on the traditional Chicken Piccata and the description alone had me salivating. It wasn’t Chicken Piccata with the tradition lemon and wine sauce, but instead, it was made with a creamy Parmesan sauce. And if you know me, you know that cheese is my weakness. I just HAD to try this. I splurged on this (but kept within my Points for the day) and let me tell you – it was well worth it. As I was thoroughly enjoying my delicious Chicken Piccata, I made up my mind that I had to recreate it. But, just like you know cheese is my weakness, I couldn’t just recreate it, I had to make it healthier and lighter. I mean, what’s the point of making something at home if you make it cheaper, healthier and guilt-free while still indulging? 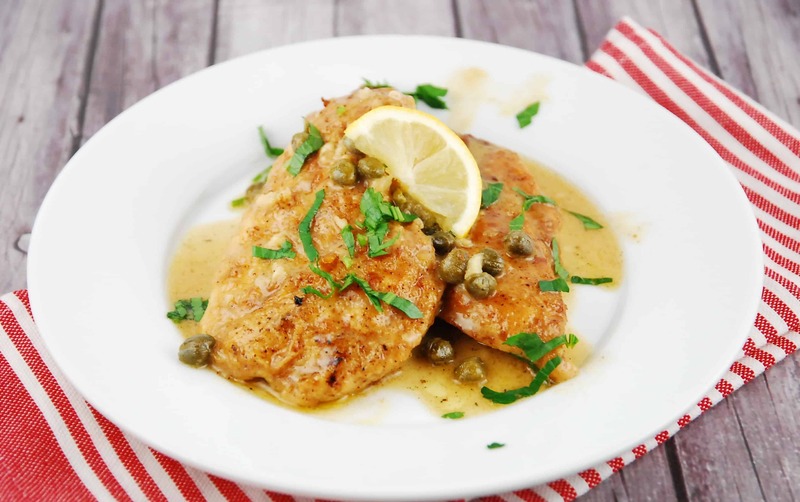 To make this healthier copycat recipe, I started with the classic Chicken Piccata recipe. Chicken “Piccata” refers to when a meat is sliced and sautéed before being served in a sauce with lemon, butter and spices. Usually, the meat for Piccata is butterflied, which is when it’s sliced open along its width. Often the meat is then pounded into an even thickness, then seasoned with spices and flour and sautéed. Lemon juice, white wine and stock are used to deglaze the pan, then the sauce is reduced. Shallots, garlic, capers, parsley and lemon are used to season the sauce before the butter is stirred in and the dish is served. My Chicken Piccata recipe uses whole wheat flour and boneless, skinless chicken bread. I sauté the chicken in a combination of butter and oil, then I got to making the sauce. I used the same broth, garlic and lemon juice from the original sauce, but I skipped the wine. Instead, I sautéed the garlic, de-glazed the pan with the broth and a little reduced fat milk. I used reduced fat milk because it’s a little creamier than fat free milk but isn’t as many points as cream. Then, season the sauce and stir in the parmesan cheese and capers. I thickened the sauce by simmering it for a couple of minutes, but then finished up thickening it with a little cornstarch instead of waiting to reduce the sauce through simmering. Just before serving, you stir in the lemon juice for that classic bright, tangy flavor and rewarm the chicken in the sauce. This was so delicious that I just ate mine right off the plate, but my kids enjoyed theirs over pasta. I think that next time I’ll serve this with zoodles. It would add a beautiful color to the plate and feel more classic Italian with the “pasta”. This Creamy Lemon Chicken Piccata is amazing. IT’s the ultimate in gourmet comfort food that is still reasonable in points. You can indulge without feeling guilty! A twist on traditional chicken piccata, this version delivers a creamy, comforting sauce that is decadently divine. Slice chicken breasts into 4 thin filets. Mix flour, salt, and pepper in a shallow bowl, and dredge each chicken filet in the four, making sure to evenly coat both sides. Shake off excess, and set aside. Heat oil and butter in a large skillet over medium high heat. Cook the chicken until golden brown and cooked through, about 2-4 minutes per side, depending how thick the chicken is. Remove chicken from pan, and set aside. To make the sauce, add the garlic into the skillet, and cook for about 1 minute. Reduce heat to low-medium, add the broth and milk. Bring the sauce to a boil; season with salt and pepper. Stir in parmesan cheese and capers and let simmer for about 2 minutes until it gets a little thicker. Then mix the cornstarch with 1 tbsp of water, and whisk it into the sauce. Now stir in the lemon juice, then return the chicken to the pan. Let warm a minute, then serve. Made this for my sister’s birthday dinner and it is delicious! My husband and I both love this recipe! had it twice this week. Delicious with roasted vegetables. This recipe looks delicious! I love your site. The only suggestion I have is that your “print friendly” button only pulls up the description and not the box with the recipe (unless I am doing something wrong, which is quite possible). Thanks for the many wonderful recipes. Looking at the Nutrition section and you have carbs listed twice. Is it 9g carbs and 40g protein? Thanks! Can’t wait to try this recipe!